As mentioned yesterday, the second interesting paper going to the Council’s Infrastructure Committee is in relation to Transport Trends (page 9). It highlights many of the same trends that we’ve been noting for a few years now and shows that change is happening in how Aucklanders get around. A summary of the trends is below. Journey to work information from the 2013 Census was released in February 2014. The journey to work data showed an increase in public transport modeshare from 2006-2013 from 8% to 10%, a reduction in private vehicle modeshare from 86% to 84% and an increase in walking and cycling modeshare from 5.9% to 6.3%. 44% of the growth in journeys to work between 2006 and 2013 was by public transport, 41% by private vehicles and 15% by walking and cycling. 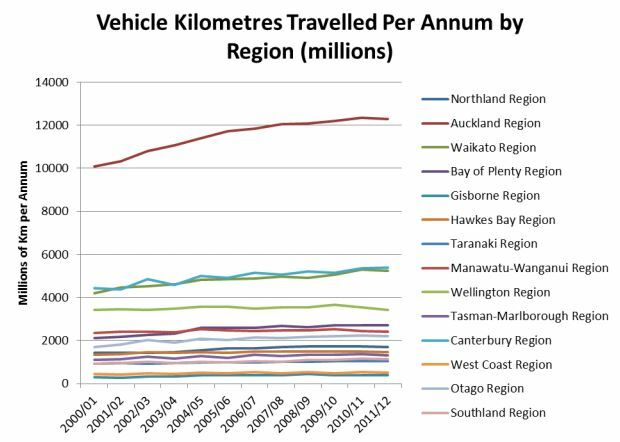 Slower growth in VKT, including declines in VKT per capita observed in Auckland and across New Zealand over the past few years are consistent with changes in transport trends observed internationally in a wide variety of developed countries. 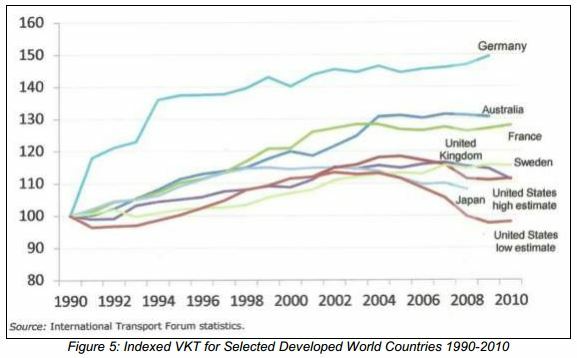 Most developed countries show a decline in VKT per capita and slower VKT growth since the middle of last decade (generally pre-dating the Global Financial Crisis) with some countries (such as the United Kingdom) exhibiting a decline in VKT per capita for a much longer period. International literature outlines a variety of reasons behind the change in transport trends over the past decade. These include both short-term (e.g. effects of the Global Financial Crisis and subsequent widespread recessions) and longer term (e.g. cultural shifts, higher oil prices and growing urbanisation) causes. Recent transport trends, both nationally and internationally, are important to note because they represent a significant change from many decades of consistent growth in both VKT and VKT per capita, as well as a change from previously persistent declines in public transport and active transport modeshare. Growing international recognition of the longer term causes of these changes is also extremely important in relation to future transport projections, to ensure that those forecasts are not over-projecting future VKT, leading to unnecessary investment. The journey to work results from the census is something we’ve covered before including how it’s changed over time. The paper also compares Auckland’s results with those seen in some of the key Australian cities which shows that we still have higher levels of car use for getting to work than our neighbours to the west however we do seem to be doing better on walking. 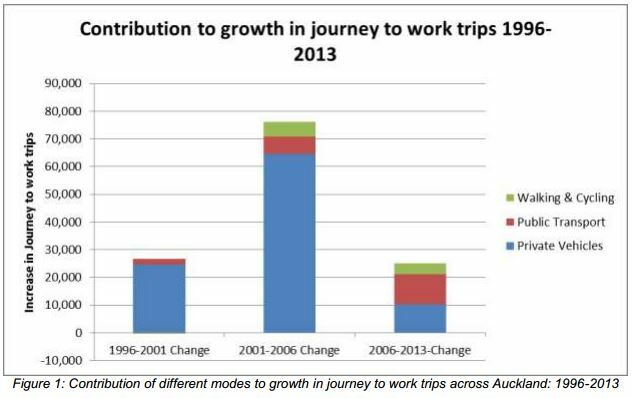 The big news story from the census in relation to transport was that from 2006 to 2013 while all modes grew, the largest growth in trips to work was trips on public transport. It’s probably the first time in many decades that has happened. The report notes that it’s a clear sign the investment in improved transport choice and travel planning has had a major impact. The report moves on to data from the Ministry of Transport on vehicle kilometres travelled (VKT) and says that while the total number of VKT has increased since 2001, the majority was in the 2001-2006/7 period after which the growth slowed and even went backwards in 2011/12. On a per capita basis however represents a real decline in how far people are driving. 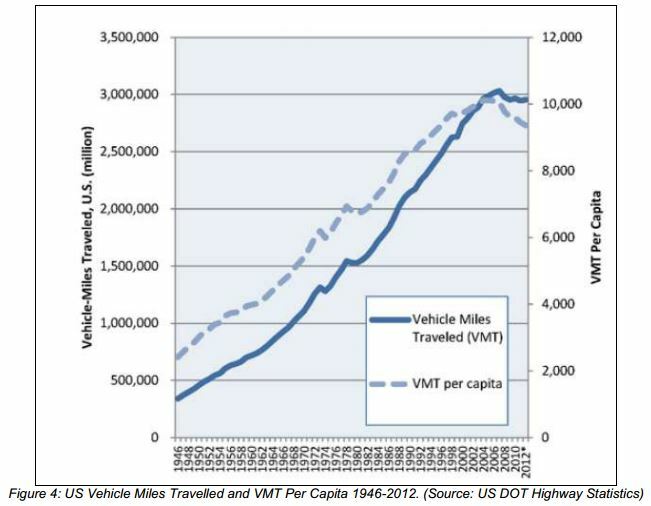 We also know that similar trends of flat lining falling car usage have been seen overseas and the paper highlights this through the graphs below show US vehicle miles travelled in total and per capita. The second graph compares a number of other western countries, most of which VKT fall off. from around 2003. 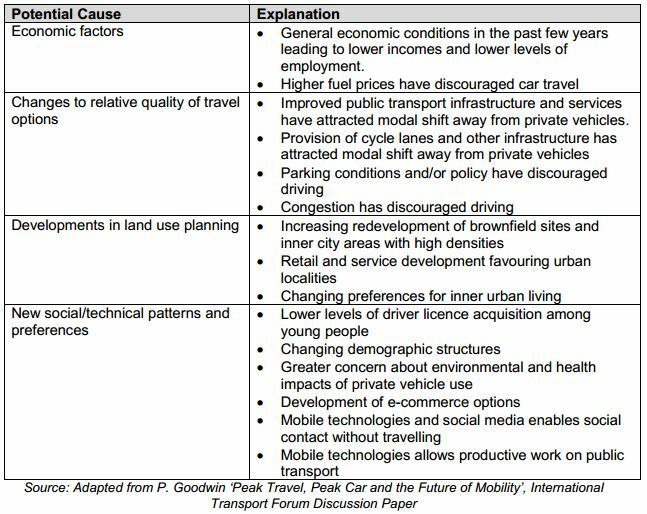 The report lastly covers off some of the implications from the changing transport trends. Probably the key is that the councils transport models will need to be updated and that is likely to result in changes in the mix of projects that are likely to get built. Combining the changing trends with the tighter funding that is likely to eventuate and we might just end up knocking a few of the crazily stupid roading projects (like Penlink) off the list for some time. This report was also picked up on by the Herald yesterday. It’s good to see the mainstream media finally starting to pick up on some of these trends. Why are trips made by people to places other than work excluded from here such as to uni? It seems strange to exclude such a large group of people for whom PT is pretty important from central transit planning. what do you mean “exclude”? Basically I mean the data above are excluding the 60,000+ people commuting into Auckland Centre for study, and excludes people who are actually working but are technically still studying such as trainee doctors, nurses, physios etc. This is a huge distortion of the data and basically means the PT mode-share is likely much greater than the data above suggests. as well as the tens of thousands of secondary school students who commute each day, apparently education isn’t worth considering when looking at travel mode share, the data is basically interpreted as to how the government and AT want, i.e. to show that most people travel by car. The Council paper is focused on relative trends; you seem to be focused on absolute levels. Differences in absolute levels do not necessarily flow through into different trends. For example, if PT JTW increases by 50% between censuses, then its possible total PT usage also increased by 50%. In terms of understanding trends, JTW data is useful because 1) it’s a comprehensive sample of people over time; 2) it collects readily comparable information on different modes; and 3) it can be spatially referenced (e.g. home/work). I know of no other data set that currently has these characteristics and hence can completely understand why the Council paper reports this data. My confusion stems from the fact that 1) this post is about a Council paper while 2) you seem to be criticising census data itself. Your criticisms are valid, but seem somewhat off-topic. In the Australian census the question is ‘journey to work or education’. Makes much more sense. Isn’t study the ‘work’ of the student? It is a bit weird that education is excluded, and should be easy to collect. Though it might cause problems with comparing with past data – perhaps get people to answer only the question if they didn’t work? Lots of students work, as well, and I wonder if it’s really skewing the results to ask them about how they travelled – since if you work on Census Day, you may well have gone there from university, rather than from home. I am currently waiting patently for AT to get me this data, which they say they have. Am being pinged around the organisation from one nice but seeming ineffectual person to the next…. The Minister uses this data as if it describes total travel demand, it is essentially a huge distortion by omission. Combination of answers to questions could normalise data for the old series- there’s a question directly on whether you are in work. So if you answer yes to that and no to question on study and ‘away from home’ to the question on where you work, it would be reasonable to assume that travel that day was to your place of work. Look at that drop off in Wellington VKT. Just at the same time that NZTA are desperately trying to start their Transmission Folly; Hutt – Porirua over-the-hill; and the Basin Motorway. Not only are VKT dropping, but cars are becoming much more efficient thanks to a mixture of foreign standards and consumer demand, and hybrids are creeping into the fleet. These combined mean that their major revenue source is going to drop dramatically over time.